The story goes that Tim Burton would only agree to direct "Alice in Wonderland" if Walt Disney Pictures, which owned the rights to his 1984 short "Frankenweenie," would permit him to direct a feature-length version of that work. 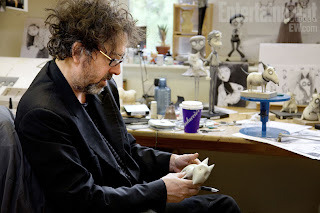 As such stories go, it seems a little too good to be true, considering that "Alice" wound up making a billion dollars worldwide and "Frankenweenie" (2012) probably won't even make 10% of that, but he's Tim Burton and can do pretty much whatever he wants in Hollywood, so it is very possibly true. It is another stop motion extravaganza from the master of stop motion animation, so if you liked "The Nightmare Before Christmas" or "The Corpse Bride," this should be one that you enjoy. Burton has a very distinctive style that best can be called "creepy," so his films are best screened late at night when the wolves are howling in the distance and the moon is full. This is a take-off on Mary Shelley's "Frankenstein," and, as always, Burton puts his own unique spin on the material. Young Victor Frankenstein (Charlie Tahan) tends to keep to himself in the town of New Holland, so his father (Martin Short) encourages him to play sports and do other things besides scientific experiments. Hitting a home run in his first game playing baseball, Victor is thrilled, but his enjoyment ends abruptly when his beloved dog Sparky (Frank Welker) chases the ball into the street and is run over by a car. Victor can't let go of Sparky's memory, so he digs the dog's corpse up and brings it upstairs to his attic laboratory. 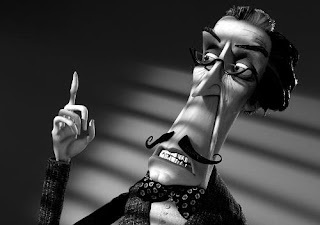 Adapting a science experiment presented by his science teacher Mr. Rzykruski (Martin Landau), Victor uses lightning to reanimate Sparky, who promptly sees a cat and bolts out of the attic and into the street. Victor's classmate Edgar Gore (Atticus Shaffer), who has a deformity giving him a hunched back, sees the dog and forces Victor to help him with his own reanimation project - a dead goldfish. Something goes wrong, though, and the goldfish doesn't just come back to life, it turns invisible. Edgar can't help but talk about the goldfish with his friends Nassor (Short), Toshiaki (James Hiroyuki Liao), Bob (Robert Capron) and "Weird Girl" (Catherine O'Hara). They are all fascinated and decide to reanimate other creatures as a science project. Victor's mom (O'Hara) and dad discover Sparky and almost pass out from shock. Sparky runs away, and the family winds up having to look for him. Meanwhile, Edgar and the others use his Victor's absence as a chance to steal his reanimation formula. 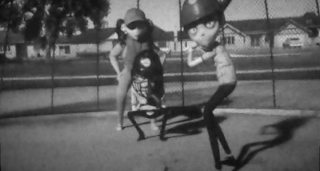 Unfortunately, when they try to apply the formula to their own dead pets and other dead things that they found in the trash, they mis-apply Victor's work and turn the reanimated creatures into monsters: Weird Girl's cat Mr Whiskers turns into a vampire cat, Edgar's dead rat becomes a were-rat, and so forth. The monsters all break out and begin causing trouble in town. 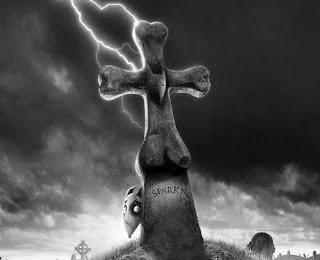 Victor recovers Sparky at the cemetery, and while doing so he finds out about the monsters. Pandemonium follows as the monsters start exploding, dying and doing all sorts of crazy things. Elsa van Helsing (Winona Ryder) is kidnapped by Mr. Whiskers and whisked off to the town windmill, where she is held hostage. The town sees Sparky and, afraid that he is a monster as well, chases him to the windmill. The Mayor sets the building on fire, but Victor and Sparky enter it to save Elsa. During the rescue, Victor is trapped, but Sparky sets him free, only to be grabbed himself by Mr. Whiskers. The two pets thus are alone in the burning building, and it looks increasingly as if Victor will lose his dear pet once again. Elsa - she looks a bit like young Winona, don't you think? The release date for the film was pushed back a couple of times, but finally it was released on September 20, 2012. Most people seem to like it. It is loaded with references to classic movies such as James Whale's "Bride of Frankenstein," and the whole thing feels like a homage to great film moments of the past (the fact that it is in black and white underlines that point). Victor does not actually yell "It is alive," because that is too obvious, but he might as well have, seeing as how he is surrounded by copies of the equipment from the original "Frankenstein" film. 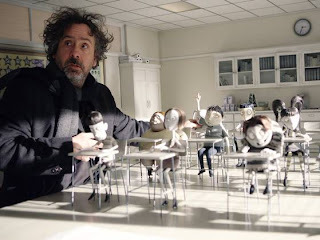 Unfortunately, the flip side of that is what might be called a "lack of originality," though that really isn't the right phrase because everything that Tim Burton does is original. His genius, among others, is the ability to mix the profound and the mundane in such a way that mundane appears profound and vice versa. 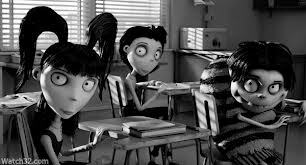 Here, the story is so well known that you sort of follow along, wondering what defining moment of some classic monster film Burton will lampoon next. 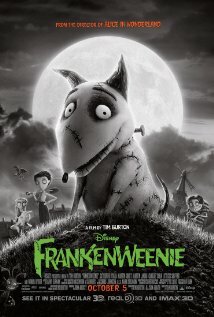 Danny Elfman does the music, which is almost a given in a Tim Burton stop motion film. It must be nice to have friends like that who will help you out with your pet projects! The voice actors are all top-notch. Johnny Depp and Helena Bonham Carter took a pass on this project, but Martin Landau, Martin Short, Catherine O'Hara and Winona Ryder all do fine work. Elfman's moody score is very reminiscent of "Batman" and seems more repetitive than usual. 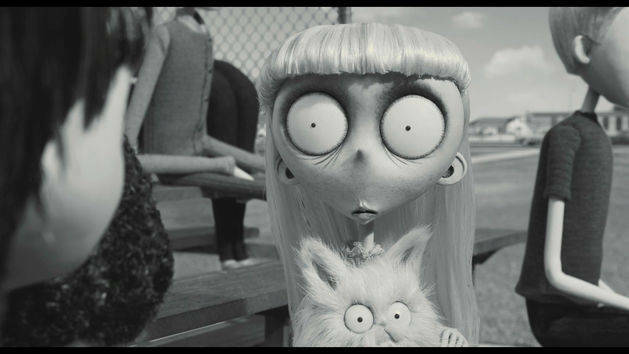 Mr. Whiskers and "Weird Girl"
As an homage, the film is brilliant. Fans of classic monster movies will have a field day picking out which scenes and movies Burton is referencing - and they sometimes are his own. As one example of this, Edgar makes a fine Igor. As an original form of entertainment, though, the film is lacking any kind of freshness. Everything leads nowhere, there is no resolution, no point, no real conflict - things just happen, people do quirky things, odd results happen from simple mistakes, and it is the usual parade of spectral imagery as the dead walk the earth and so on and so forth. 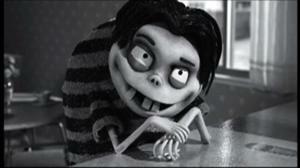 By now, if you are a Burton fan, all that must sound painfully familiar. One hopes that he decides to expand his horizons beyond the "it's a thin line between life and death" mantra that consumes so many of his films, especially the stop motion ones. The mere fact that this film is so instantly identifiable as a Burton job is both the best and the worst things about it. This one is for fans of Tim Burton and the stars. Anyone else wishing to see a quality stop motion animation project from the modern master of stop motion is advised to seek out his other such films listed above. 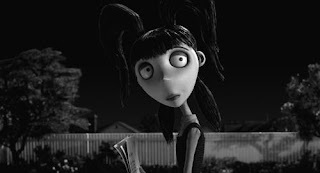 It's not that this is a bad film, because it isn't - it's that Tim Burton has done it all before, better, and with more feeling, in films that aren't loaded with the equivalent of inside jokes for film geeks.